It was one of the warmest days we’ve had this year in the Midwest, making it a beautiful night for a concert. This was this writer’s first trip to The Roxy; the venue is small, but has an interesting setup and the sound system is excellent. The floor that the stage is on is actually lower than most of the venue and there is an open area around the stage, allowing one to stand next to the stage or sit in the area around it, making one eye level with the band. It gave people options. The show opened with Kansas City’s own Evil Kunst, an odd and interesting band. It was this writer’s third time seeing them, and while Evil Kunst is purposefully making challenging music, the band – producer Jaundice Joplin, guitarist Kyle Clavicle, and vocalists Painless and Irate Dreamer – knows what it’s doing. Painless, the lead singer, uses a monotone, almost spoken word style that would occasionally raise up to shouting, sounding like something out of a poetry slam, while Irate Dreamer mainly adds background color by way of guttural growls and barks. The programing mainly consisted of distorted breakbeats and buzzy bass, but unfortunately, some of the finer details were lost in the sound mix. When the guitar came in, it sounded like it was from another song all together, adding to the spoken word, jazzy feel. Next up was Hexheart making their Kansas City debut. Comprised of God Module members Jasyn Bangert and Andrew Pearson, with the addition of guitarist Patrick Hogan, the band’s performance was more straightforward and less theatrical than the usual God Module show… but Hexheart is a very different animal. Bangert’s vocals were as good – if not better – than they are on the album, and though his delivery was a little less melodic at times, it was made up for emotional forcefulness in certain parts. He entered an almost trancelike state while performing where he would look up at the ceiling most of the time, giving off a depressed vibe with his body language. His interaction with the audience was minimal, but once the set was over, he came out of it and thanked everyone for coming out and seemed genuinely cheerful. Pearson’s synth work was on point, only having a minor issue with a vocoder. The beats hit hard on some of the faster songs like “Lunatix” and “Nothing,” making them the standout tracks for the night. But it’s Hogan’s guitar work that elevates the music to being more than just a mellower version of God Module to give it an authentic ’80s post-punk sound. The Rain Within, the synthwave project of Bella Morte’s Andy Deane, played next, with Ego Likeness drummer joining Deane onstage. If this writer had to describe The Rain Within’s performance with one word, it would be “lasers.” If it had to be two words, it would be “lasers and vocoders.” There was a lot of both, as the visuals consisted of lasers behind the band and Deane wearing fingerless gloves with lasers on the knuckles. It took some time to realize that the sunglasses both wore may have been as much for eye safety as they were for fashion. The set was decidedly more upbeat and energetic than the previous bands, and Deane’s vocals perfectly fit the synthwave vibe as he completely commits to it, dancing along with the music for much of the set. Almost half of the set consisted of songs from the newest album Atomic Eyes, picking out songs like “Realign” and “Rain” with some older favorites like “Murder” and “Everything” making up the rest of the set, plus one cover. While Bella Morte is known for doing cover songs that sometimes come off as cheesy or ironic, The Rain Within’s cover of Rihanna’s “Umbrella” only came off as slightly tongue-in-cheek. Again, Deane committed to the performance 100% and really let his vocals shine through, showing that he really is a great singer. The band closed out the night with the somber “Silence and the Sea” and still managed to make it feel upbeat through sheer force of personality. 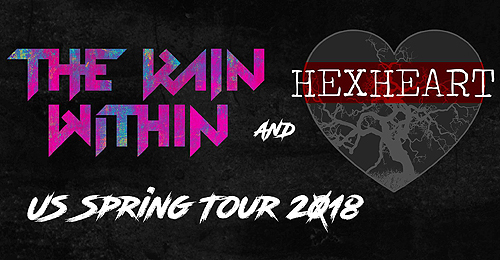 Hexheart and The Rain Within make an interesting concert pair as both bands are side projects by people that are in other long running bands. They also show different sides of the current ’80s resurgence happening in the industry with Hexheart playing the more gothic darkwave and The Rain Within playing more of the straightforward upbeat synthwave. In the end, the bands and the crowd enjoyed themselves while trying out something new.